Tell us what inspired you to take that step into journalism. My father, Jaydeb Mukherjee was instrumental in guiding me. He realised that I liked writing, and I always preferred Shakespeare more than Newton in my school days! I guess the germ was already created; it needed the right soil to bloom. Can you remember from your earliest days as a journalist, where you would go to see what stories you could pick up? Not really! That’s not how we “hunt” stories in India. We believe in “networking”, and that’s very critical. Being an avid Indian cinema fan, I would keep track of every news that used to reach me. And I would try to pick on stories from that piece which senior journalists would miss. I remember reading that how Sanjay Leela Bhansali was very keen on having a particular track by Ismail Darbar in Devdas, and that’s when I read that he was trying to record a song with a debutant singer. I used my networking to “hunt” the voice, and finally, my “networking” helped me in discovering Shreya Ghoshal. I was the first journalist to interview her for The Asian Age in Kolkata, and much later when I visited Mumbai, she agreed to be a part of my chat show too. That’s how we “cultivate” our relationship with artists. You have worked for some of the top publications in India such as Mumbai Mirror as assistant editor, how did this come about? It was the result of sleepless nights and delivering what my editor Meenal Baghel expected from me. I must admit that working with Times of India group (Mumbai Mirror) was the toughest and yet the best phase of my life. I got worldwide exposure, freedom to write feature stories on various subjects related to cinema, television and music. Which other media publications have you personally contributed too? Many… I started journalism with a fortnightly in Bengali called Sambad Ekhon (New Now) and Pratahik Sambad (Morning News) for which I was never paid, barring the travel expenses. But my parents supported me, so I was not financially burdened. Later I started working with The Asian Age in Kolkata as a freelancer, and soon got an offer to join them as a reporter. After working there for almost four years, I got an offer from Stardust film magazine in Mumbai, and I shifted my base to Bollywood. After my tenure in Mumbai Mirror, while I was working with British Nandy Communication as Vice President, I contributed regularly for Midday, Ananda Bazar Patrika and several online portals. Finally, I was again offered a job in Stardust, this time as Editor in Chief. You are best known for Hema Malini coffee table book – Diva Unveiled, an unofficial biography which was published in 2005, what made you come up with this idea? That’s a long story. Basically, Mr Hira was planning to bring out a book on Hema Malini after the success of Baghbaan. He wanted Biswajit Ghosh to write the book, as a part of series “Hall of Fame” which he was writing as a commissioned project for Magna Publishing. But when my editor Sonali Kotnis Jaffar and group editor Ashwin Varde came to know about my proximity with Hema Malini they requested Mr Nari Hira to assign me the job. I started off the project as Hall of Fame but soon realised that the content (text and images) which I produced was not fitting into the existing format. It was Ashwin Varde and Nari Hira who decided that they will print the book as a coffee table book. Till date Diva Unveiled remains India’s only coffee table book on any Indian actress. What was it like receiving Best Author Award for the book? It’s God’s grace and love from my colleagues. Awards are always special, and that too when you receive it for your hard and honest work. Was it difficult to collect so much information about such a phenomenal star as Hema Malini? Yes! It was difficult to get information which were unheard. I didn’t want to tell the same story, so if you read the book, you will realise that it’s treated almost like a film screenplay, and could be easily adapted into a biopic. I would give credit to my editor Nooshn Mowla, Hemaji’s sister-in-law Prabha, my friend Swarup Nanda from Leadstart Publishing and my wife Sarbani Mukherjee for working in this project and helping me in achieving the goal. Why did you decide to take a step into films? I guess it was a natural progression after producing a finite series for Zee TV in India. I always wanted to tell a story but never had the courage to tell it via a visual medium. I need preparation. I started with my first fiction book Long Island Iced Tea and then made a 156 episode series Bin Kuch Kahe with my friend and filmmaker Rajshree Ojha. After that, I wanted to produce a feature film in Hindi, but for some strange reason, that film remained unfinished due to financial issues. After that, I decided that I will make my own film, and tell the story which I want to tell. That’s how the germ of direction was born. How did your collaboration with Esha Deol Takhtani start? I’ve known Esha since she was a kid, and later she joined the film industry. I was amongst the first journalist to interview her in Kolkata during her debut film Koi Mere Dil Se Pooche. Since then we used to interact on a professional level. Frankly speaking, we never had any bonding or such, because I used to mostly interact with Hemaji, and she had her set of journalist friends. We started bonding just before her marriage when Hemaji wanted my wife Sarbani to handle the entire media. That’s when she realised that we are professional and I think she grew affinity towards me and my wife. Much later when I was writing a book on Hemaji (Beyond The Dreamgirl), I decided to interview her. That’s when she opened up like never before. I could see a much matured Esha, and that’s when I decided to work with her. In fact, Hema ji was not even aware that we were doing a movie together, and neither had she had any clue about the fact that I will be directing the movie. Now tell us about the short feature film Cakewalk, you were in London for the official UK unveiling of the poster for the film. How did you come up with the story? I would like to give the entire credit to Nari Hira and Ashok Dhamankar from Magna Publishing for hosting us, and organising the poster launch of Cakewalk. I know what all struggle Ashok had to go through to make this event a grand success. 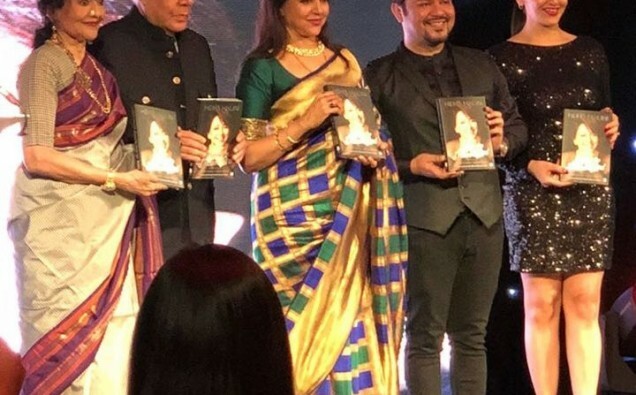 I would like to thank my producer Shailendra Kumar who introduced me to Radio Jockey Dev in London, and he introduced me to publicist Kully Kaur who finally came like a fairy to make this a dream launch. What was her reaction when you gave Esha the script and said it was a short feature film? Esha liked the story and asked me to develop the screenplay. It took a while for her to give a final nod because she was very keen on conveying a certain message in the film. But she was sure about a fact that if she says yes to the film, then it has to be directed by me. She had a total conviction on me as a story teller, and I don’t know how she actually pushed me from the cliff, only to make me realise that I can fly! Did Esha have any input into the film? Yes, she is a pro. After working with the likes of Yashraj Films, Dharma Productions and Mani Ratnam, she comes with her own sense and sensibility. I feel that she was not used properly by her directors, or maybe she didn’t get enough characters to show her acting prowess. But whatever she suggested on dialogues and scenes had only enhanced the film. So I am happy! When will Cakewalk be released? Good question! I am waiting for studios to lock the deal. It’s a movie, and I have treated it just like a film. Yes, it’s not a ten crore cinema film, but there is an investment that needs to be recovered before we release it. I am not looking at YouTube releases; I am looking at digital platforms like Zee 5, Voot, Amazon, Netflix, Sony and Reliance. I need a bigger platform to dish out this cake. Why did you decide on a short feature film and not the standard full feature length film? I think we all need to learn how to walk before we learn how to run! As one of the top ranking journalists can you advise our readers on how they can follow their dreams and go into a career in journalism? Just believe in your dreams, and work honestly. I think everyone of us can become a hero; it’s just that we need a push from the cliff, to know that when you have a pair of wings, then why walk those miles?